Betfred has been popular with matched bettors for several years now – due to great offers like Betfred pushes. This endless stream of profit-making offers and price boosts has gained Betfred a big market share. Let’s take a look at how to take advantage of Betfred pushes. Betfred is an independent bookmaker that offers some of the best value odds in the sports betting industry. Betfred online and shops can be a happy hunting ground for matched bettors. The eponymous Fred Done runs various price boost periods under his Betfred pushes label. Betfred pushes generally focus on major sports, and the maximum stake is generally £100 per boost. Horse racing: Saturday morning between 0930-1100 hrs usually involves a number of horse racing boosts. These boosts tend to be a few ticks above the exchange lay price, say 4.50/4.20, 5.50/5.20. Football: Enhanced trebles on Premier League and European football. The Premier League multiples can often be layed on betting exchange accumulator markets. On 12 August 2018, we had Liverpool, Rangers and Southampton all to win at 5/2 (3.50) and 3.15 to lay on Smarkets. Golf: On Saturday mornings 0930-1100 hrs during the golf majors, Betfred will often push the current leader to an industry best price. These boosts are quite rare though. Boxing: Fred likes to push British boxers to arbable prices. He has boosted Tyson Fury to beat Wladimir Klitshcko (won) and Tony Bellew to beat Oleksandr Usyk (lost). Where can I find Betfred Pushes? Betfred pushes are available both online and in Betfred shops. However, I usually head to the betting shops as taking too many pushes online will lead to a swift gubbing. When are Betfred Pushes available? Midweek bonus hour: Weekday lunchtimes 1200-1300 hrs and weekday evenings 1700-1800 hrs. Sunday boosts from 0930 or 1100 hrs and the Sunday bonus hour 1200-1300 hrs. These times often vary for major horse racing festivals like Cheltenham, Ascot and Goodwood. Check towards the back of the Racing Post newspaper each day for a list of boosts and the relevant timings. Back and lay. You can lay off Betfred pushes for a small guaranteed profit, as the push price is often higher than the betting exchange lay price. The horse racing boosts on Saturday morning are particularly ripe for this tactic, with the added bonus of qualifying for Best Odds Guaranteed on selected horse races. For example, place a £10 bet on a horse at 9/2 (5.50) with Betfred. Then, assuming the lay odds are 5.30 we can lay for no loss. EV+ advantage play (AP). Alternatively, you could treat the boosts as value punts, especially the football enhanced trebles which cannot be layed at the exchange. Take this 3/1 (4.00) football treble on 24 November 2018. The combined lay odds multiplied were 3.79 (Monchengladbach 1.44, Marseille 1.85, Sevilla 1.42). Divided the back odds of 4.00 by the combined lay odds of 3.79 and multiply by 100 = 1.06% EV rating (4.00 divided by 3.79 = 1.055 x 100). 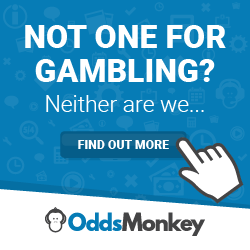 This means that we would expect to win £106 for every £100 staked across a sample size of several thousand bets. This treble won, but not all AP bets will win – the key is to think of the long-term positive maths. In the recent past, Betfred has offered small free spins and free bet offers in shops. These vary locally. Betfred is an independent bookmaker, so he sets his own agenda, including some industry leading prices and promotions. In Summary, Betfred pushes is one of the longest running matched betting opportunities. Just don’t max out every boost to £100, otherwise you’ll be swiftly gubbed (online) or shubbed (retail shops).